Online app for sound reinforcement system calculations covers acoustics, electronics and cabling, lighting, electricity and recording. 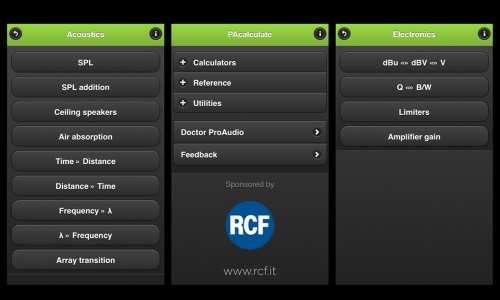 Offering a tool for pro audio sound reinforcement system calculations, RCF is sponsoring the online app PAcalculate. The multi-platform app (iOS and Android) provides a library of 25 different calculators covering audio acoustics, electronics and cabling calculations; as well as lighting, electricity and recording calculators. The app is a quick and handy tool for people dealing with PA, sound systems, electro-acoustics and lighting. With PA as well as lighting related calculators, comprehensive options are provided. In addition to the calculators, other help menus offer assistance on cable pin assignments for both audio and video, graphs demonstrating microphone polar patterns and equal loudness contours; and offers utilities including an inclinometer and even a flashlight. PAcalculate can be downloaded for free courtesy of RCF for smartphones and tablets at the Google Play Store or Apple App Store.